So I announced last week that my family (husband and two boys) are moving to Suzhou, China in July. I will be the senior school librarian and head librarian at Dulwich College, an English-speaking British international school. I will be posting frequently about our experiences up to and after our move. I am especially interested in Chinese perceptions of the US, differences between the schools, and what it's like living as an American in a Communist country. Needless to say, this is a huge step. When my husband (also a teacher) and I first applied with Search Associates, we woke up the next morning and thought "what have we just done?" We have had lots and lots of discussions about whether this was the best thing for us, for our children. Would we regret it? Are we ready to leave our friends and family? It took a little bit to get used to the idea of teaching abroad. By the time Dulwich emailed me in mid-November, we had had about a month to get ourselves used to the idea. By that time, we were raring to go. If you are thinking about taking the plunge of international teaching, know that this self-doubt period is absolutely normal. It helped talking to our friends who did this last year and are now teaching in Seoul, Korea. If you are thinking about doing this and need some support or have specific questions, I am happy to help you in any way I can! Please feel free to email me at mrsreaderpants (at) gmail (dot) com. So it's now nearly the end of December. We've been officially hired for about a month. We have been in constant contact with the Dulwich HR department, who have been very helpful in guiding us through the Paperwork Mountain we need to get through to teach there. 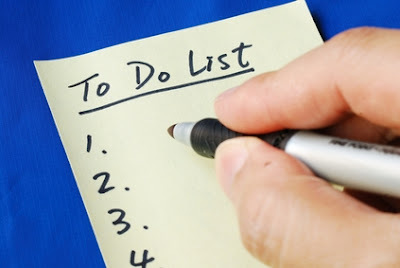 At first, all this felt so overwhelming, so I decided that instead of reading the whole list of things I need to do, I am going to only focus on the NEXT thing I have to do. Whenever I start to feel overwhelmed by the list, I just remember that I am only worried about the one "next thing." HR sent me a copy of the DRAFT contract. It was 22 pages. I had two weeks to read, ask any questions I had, sign it, scan it, and send it back to HR via email. Passport--I needed one, and so did both my boys (ages 6 and 9). My husband already has one. Mine cost $145, and each boy's passport cost $110. YIKES! To help with the financial dent, we did my passport in November and the boys' in December. We have received mine, but we are still waiting on the boys' passports. Signed my official contract. It was the same as the draft copy except this one included my husband's and my passport numbers. Again, I had to print it, sign each page, scan it, and send it back to HR via email. I also had to send scanned images of both our passports. Scanned and sent the following copies to HR for both my husband and me: copies of all diplomas (since they were too big to scan, I took photos with my phone, which HR said was fine); academic transcripts; emergency contact form; both our teacher certificates and certification records. My husband and I both had to take the online test for foreign experts. This is a Chinese government requirement for non-citizens planning to teach abroad in China. This test is honestly a post in itself, so maybe I'll write that one next. Planned two yard sales--one in February and one in June. Almost everything must go! Dulwich does give us $2000 toward our shipping expenses, but from what I understand, that won't cover very much. Most of what we are planning to take includes entertainment stuff for our boys: movies, books, board games, video games. Most of this stuff if fairly small and may be difficult to find in English in China. We have also heard that shoes in larger sizes can be difficult to find in China, so we plan to stock up on our shoes before we go. If we have room, our boys' bikes will go with us since their bikes are almost brand-new. If not, we'll buy them new bikes in China--I hear we'll all be riding bikes a lot! Emailed the Dulwich Junior School librarian to introduce myself. My next step--which is all I am thinking about right now--is getting our criminal background check completed.We have to get that through the FBI offices in Houston, TX. We also have to get fingerprinted as part of the background certificate process, but thankfully, the fingerprinting place isn't very far from our house. I am so happy for you! I am going to live vicariously through you! I really hope it is everything you want! Congratulations on your new job! I only found your site recently so I am glad you will continue to update. I lived overseas for 15 years and was librarian at international schools in Singapore and Kazakhstan. Hardest thing to deal with is the looooong distance travel to get home and the jet leg on both ends. But, we enjoyed everything else. Advice: leave room in your luggage for all those beloved food items that you won't be able to get there. Check ahead if you are allowed to bring movies. These are often confiscated in countries like China. Look into a slingbox for TV programming if you can find a friend or relative who will "host" it for you. Have fun! @fbmount--Thank you so much for your response and advice! We had applied at two Singapore schools and are hoping to go there for a visit. I am already planning to ship myself a bunch of popcorn kernels since I hear those are hard to come by in China! We did check the movies, and we can ship up to (I think) 250 DVDs as long as they are in original cases. We are also looking into getting a VPN to host our internet so we're not blocked by the Great China Firewall. I just found your blog as I 'research' Suzhou, I am also moving there at the end of summer to work at the same school. It is nice to see I am not the only one who felt like there was an immense amount of paperwork, its a relief now I am coming to the end of it! Oh my gosh! Carat, please email me! I would love to hear from another Dulwich newbie! My email is mrsreaderpants [at] gmail [dot] com.